Even as he watched, the mist was dissolving, and glancing down to the harbour, he saw the British cruiser coasting in to her anchorage. The incisive outline of the ship seemed to emphasize and sharpen the essential helplessness of all small places in the world to resist the impact of the outer world. – from Barometer Rising, by Hugh MacLennan, published by McClelland & Stewart. Bookmarked at Halifax, December 5, 2017. 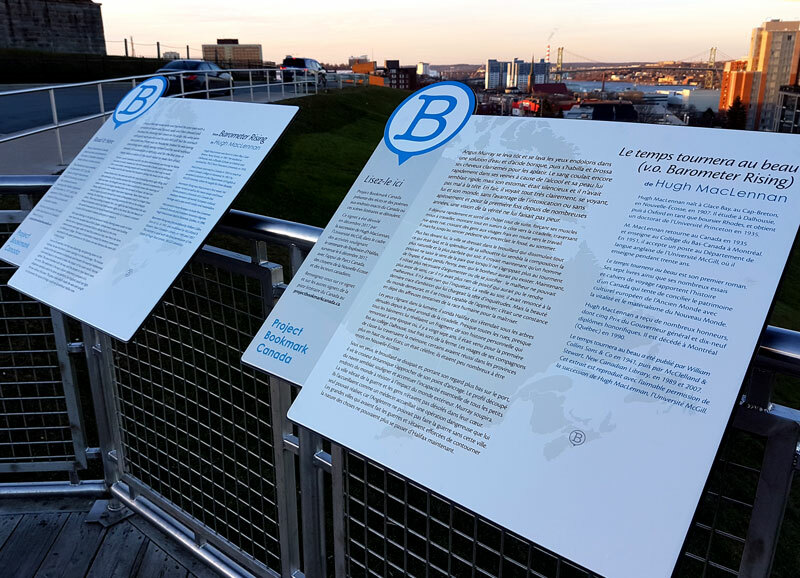 On December 5, 2017, Project Bookmark Canada unveiled Bookmark #19 at the Halifax Citadel, in partnership with Parks Canada Mainland Nova Scotia,. 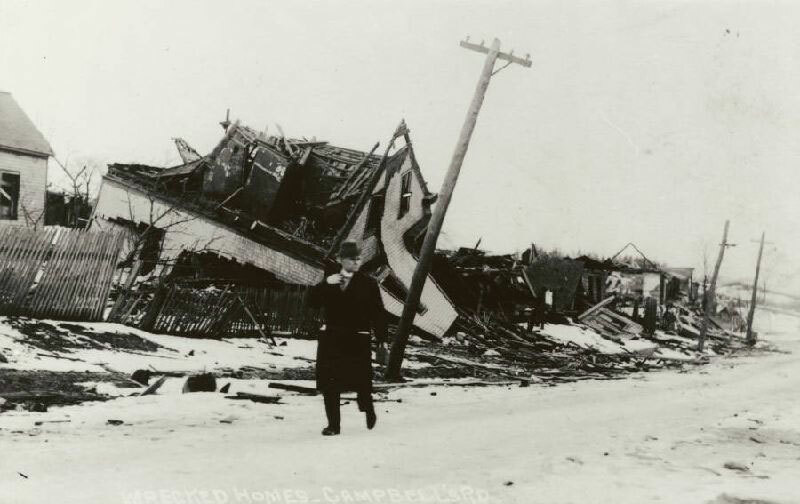 This Bookmark locates a passage from Hugh MacLennan’s first novel, Barometer Rising, a compelling romance set against the horrors of wartime and the catastrophic Halifax Explosion of December 6, 1917. A special thanks to Project Bookmark Canada Founder Miranda Hill for her vision and work to build Bookmarks in a Parks Canada community partnership. We are especially grateful to Dr. Keith Mercer, Cultural Resources Manager & Historian, Parks Canada Mainland Nova Scotia, and his team for their support of Halifax's first Bookmark and the first Bookmark at a National Historic Site. Hugh MacLennan was born in Glace Bay, Cape Breton, Nova Scotia, in 1907. He studied at Dalhousie, was a Rhodes Scholar at Oxford, and received his Ph.D. from Princeton University in 1935. MacLennan returned to Canada in 1935 to teach at Lower Canada College in Montreal. In 1951 he accepted a position in the Department of English at McGill University, where he taught for three decades. Barometer Rising was MacLennan’s first novel. His seven novels as well as his many essays and travel books present a chronicle of a Canada that mediates between old world, European cultural heritage and a new world vitality and materialism. MacLennan’s many honours include five Governor General’s Awards and nineteen honorary degrees. Hugh MacLennan died in Montréal, Québec, in 1990. Barometer Rising was first published by William Collins Sons & Co. in 1941, and published by McLelland & Stewart, New Canadian Library, in 1989 and 2007. This excerpt is used with the kind permission of the Estate of Hugh MacLennan, McGill University. Angus Murray woke early and bathed his sore eyes with a solution of water and boracic acid, and then dressed and brushed his thinning hair down on his scalp. His veins were still quick with alcohol and his skin felt stiff, but his stomach was quiet and there was no headache. Indeed he was seeing everything very clearly, seeing himself and his world without benefit of intoxication or self-pity, and for the first time in many years a vision of the truth failed to make him afraid. He ate a quick breakfast and left the hotel immediately, and forcing his flabby muscles to work, sweated up the hill toward the Citadel, past cross-street after cross-street, meeting people with washed faces on their way to work. He walked until he had reached the footpath circling the moat on the hilltop. Spread below him, the town lay with the mist concealing every ugly thing, and the splendour of its outline seemed the most perfect, natural composition he had ever seen. He thought now that a man could only know the meaning of peace when he no longer reached after the torment of hope. He had lost Penny, with whom there might have been happiness. Now there was no need to argue or justify himself any more: unhappiness could no longer have meaning, for there was no longer anything positive for him to be unhappy about. There was nothing to worry him. Last night he had relinquished the last thread of ambition which had held worries tight in his mind. But the beauty of the world remained and he found himself able to enjoy it; it stayed a constant in spite of all mankind’s hideous attempts to master it. With eyes blinking in the light he surveyed Halifax fanning away under its bare trees from the rounded base of the Citadel. Almost every street and building held for him a fragment of personal history dating back to the time, twenty-seven years ago, when he had first come as a boy, raw from the farm, to Dalhousie College. The faces of classmates crossed his memory; some were successful in the upper provinces or the States; one was famous; few were left in Nova Scotia. Even as he watched, the mist was dissolving, and glancing down to the harbour, he saw the British cruiser coasting in to her anchorage. The incisive outline of the ship seemed to emphasize and sharpen the essential helplessness of all small places in the world to resist the impact of the outer world. Murray sighed. The town throbbed with the war, and the people in their hearts were not sorry. They welcomed it the way a doctor welcomes a prospect of a dangerous operation which he alone can perform, for England could not fight the war without this town. The great cities which made the wars and sought to circumvent the nature of things could not do without Halifax now.